It’s school holiday and I’ve not planned for any holiday trip for the family due to my new job commitment. I really wish to take my boys for a short trip or even just for a day trip to take them out from their normal daily routine. During the last school holiday in May 12, we had a day trip to Kuala Gandah and Bentong. I posted those pictures and write up on my facebook, blog and Trip Advisor and I received lots of enquiries and respond to the post. I’m reposting the post that I updated in my treasure memories blogspot blog here. Hopefully, all of you will enjoy the day trip as much as we did. It is school holiday. For the last 2 years, Hubby and I would have our own holiday without the kids, in conjunction with our wedding anniversary. Hubby has been waiting for me to give him dates that I’m able to get away for a few days trip. I just came back from company’s team planning session in Seoul and have not planned for any trip during this 2 weeks school holiday. Two days ago, Hubby suggested to make a day trip to Kuala Gandah and Bentong. A parent of Kumon student recommended him to visit Kuala Gandah Elephant Sanctuary. He made some browsing on the internet and noticed that travel agent usually bring visitors for day trip to Kuala Gandah Elephant Sanctuary and Deerland Park. He also read about Bentong Chamang Fall and since these 3 attractions are quite close by, he planned the itinerary for a day trip. Initially, we were thinking of going on this coming Saturday of Agung’s Birthday Holiday. Since it is school holiday, a week end and public holiday, we believe these places would have lots of people. Since I was able to take a day off from work, we decided to go on mid week instead. We left home at 10am and reached Kuala Gandah Elephant Sanctuary at 11am. Hubby read that limited stickers will be given out to visitors in a day and made the first stop at this Elephant Sanctuary to register and obtained stickers for the day. There’s no entrance fee but visitors are encouraged to make some contribution to the sanctuary. Hubby obtained 2 red and 3 yellow stickers and made donation to the sanctuary. The staff informed us that there would be video show on issues surrounding wild elephants and diminishing habitat at 1.30pm. Since it was still early, Hubby suggested that we visited Deerland Park which is located not far away. The entrance fee to this Deerland Park is RM6 for adult and RM3 for kids. Honestly, we had not heard of this place but there were many foreigner visitors. We met 3 Japanese mothers who married to local men visiting the park with their kids. They are residing in Kuantan and have lovely kids. There are also opportunity to touch and take photo with snacks. We were at the Deerland Park for about an hour and adjourned to the Elephant Sanctuary. We walked around its information centre and read interesting stories and facts on elephants. The Japanese families brought food and had picnic lunch at this place. The only cafe at the Elephant Sanctuary. We had mee hoon noodle soup, fried mee hoon and fried rice for lunch. The taste was alright but a little salty. 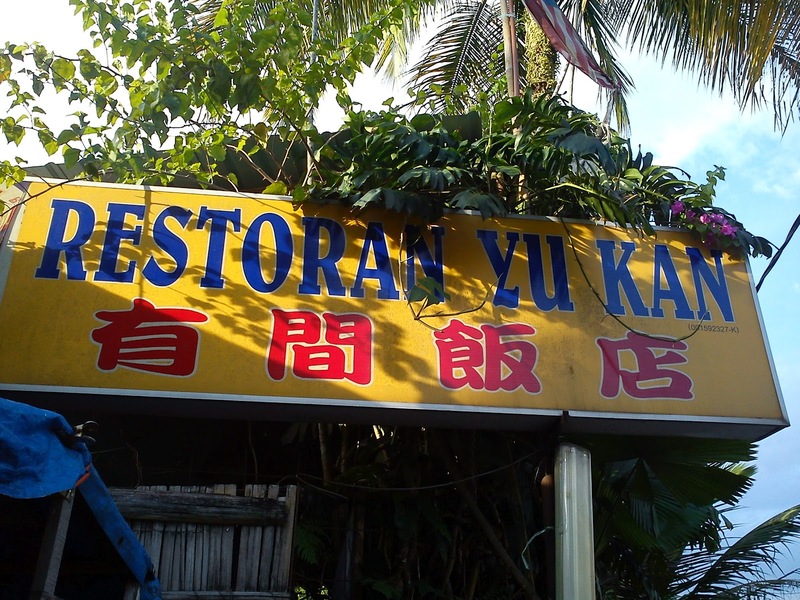 They cost about RM4.50 per plate. After lunch, we walked to the elephants feeding and show venue. Jared feeding elephant with peanuts. This lady is from London. She bought bananas on the way to the sanctuary and gave some to us for elephant feeding. In return, Hubby gave them some peanuts to feed those elephants too. Not overly crowded despite school holiday. Almost half of the visitors were foreigners with tour guide that brought them there on day trip. At 2pm, the elephants had their bath to cool down their bodies temperature. Their bodies were also dirty and full of mud which was to protect them against the hot sun. Visitors were encouraged to hand feed elephants during their lunch for bonding and trust building, before elephant rides. Cut papayas were provided by the sanctuary. Queuing for elephant rides for visitors with yellow sticker. Hubby, Jared and I had a ride on an elephant the natural way ie no basket. It was an interesting ride. After the ride, we had a cold drink at the same cafe that we had our lunch. We left Kuala Gandah Elephant Sanctuary at about 3.10pm to adjourn for Bentong Chamang Fall. On the way, there were cows on the road and we need to drive safely. We reached Bentong Chamang Fall at about 4 pm, which was just the right timing. There’s a suspension bridge that connects the 2 sides of the stream. We did not have any swim there, though we did bring extra changing clothes and towel as we did not think it is suitable for our boys. The waterfalls can be dangerous with powerful currents. 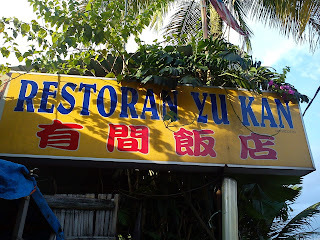 We reached this restaurant at Bukit Tinggi at 6pm and had our early dinner there. We reached home about 7.30pm and were all tired, sweaty and smelly. But it was a good and productive day trip for the family. Wear light and comfortable clothes. Bring water, sunglasses and caps as there are a bit of walking under hot sun. Make the first stop at Elephant Sanctuary to register and collect stickers as there is limited stickers given out in a day, especially the yellow sticker for rides and bath with elephants. Allow ample time for lunch, suggest have early lunch as there’s only 1 cafe in Elephant Sanctuary and everyone is rushing for the 1.30pm video show. Bring peanuts and banana to feed elephants. Make some contribution to the Elephant Sanctuary as there’s no entrance fee, for the maintenance of the elephants and park. Bring extra changing clothes and towel. This entry was posted in Day Trip, My Travel and tagged Bentong Chamang Fall, Kuala Gandah Deerland Park, Kuala Gandah Elephant Sanctuary by sawleng. Bookmark the permalink. taking this trail on Muhammad’s day – that’s my plan, now that Ernny is old enough to appreciate the surroundings. Thanks, Alex. Hope this post helps you in planning a day trip to Kuala Gandah. It was a good, short trip for my family. Interesting… will surely take my kids there someday! Amy, yes you should … do remember the “Suggestion for trip”. Avoid school holiday since your kids are not schooling yet.